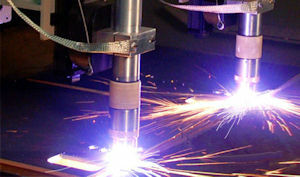 Custom Steel Plate Cutting | Holloway Company, Inc.
Holloway Steel Services uses a Messer CNC Plasma. Our table measures as wide as 12’ and as long as 40’. Our cutting capacity is up to 1 ½” thick material using a Delta rotating head that will cut positive or negative bevels. CNC Oxy Fuel Torch with the capacity to cut carbon steels up to 4” thick. High-speed divergent nozzles that use an oxygen jet that opens slightly along its passage allowing the compressed oxygen to expand as it leaves, forming a high-velocity jet that spreads less than a parallel-bore nozzle, allowing a cleaner cut. The flame is not intended to melt the metal, but to bring it to its ignition temperature allowing the metal to burn and blowing the resulting molten oxide through to the other side producing the ideal kerf in a narrow gap with a sharp edge on either side of the work piece. The oxidation of iron by this method is highly exothermic. Once started, steel can be cut at a surprising rate, far faster than if it was merely melted through. The ability to produce almost any shape from large steel plates gives Holloway Steel Services flexibility in meeting our customer’s needs.